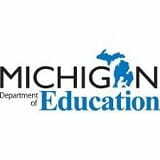 The Michigan Department of Education (MDE) uses several assessments to cover the full range of student needs. Michigan’s State Assessment System includes a variety of different assessments for different purposes. Stakeholder input has shaped Michigan’s assessment vision to align with the goals of Michigan’s Top 10 in 10 Years plan and comply with state and federal laws. For more information see: Michigan's Education Assessment System: What it is, What it Means, and What it Offers. K-12 reports for the WIDA ACCESS for ELLs assessment can be generated. The Listening, Reading, Writing, Speaking and Overall scores can be analyzed for districts' English Learners. Student assessment in grades 3 through 8 includes: the Michigan Student Test of Educational Progress (M-STEP) and MI-Access. Provides reports for students in 11th grade who tested on the M-STEP or MI-Access portion of the Michigan Merit Exam (MME). The College Readiness report shows how students performed on the College Board SAT in the subjects of Evidence Based Reading and Writing and Mathematics. Historical ACT reports can also be generated. The Student Growth report shows changes in student scores over time for students who have taken two or more consecutive state summative assessments in Michigan. The Students Not Tested spreadsheet provides summary information on students who were expected to participate in a State standardized assessment, but who did not. Analysis of students who scored in the upper, middle, and lower range on state-administered standardized academic tests as compared to their peers within the school. Various resources to help education professionals utilize our assessment reports. Are you interested in providing feedback on how CEPI and MDE can continue to improve the student assessment reports? Educators, parents, and others who may be interested in providing this feedback can fill out this survey. This survey additionally invites stakeholders to participate in future surveys or focus group activities. For questions related to the mischooldata.org reports, please send an email to cepi@michigan.gov or call 517-335-0505, ext. 3. For questions related to this survey please send an email to mde-oeaa@michigan.gov.